a. Install SST to piping clamp. HINT: Confirm the direction of the piping clamp claw and SST using the illustration showing on the caution label. b. Push down SST and release the clamp lock. NOTICE: Be careful not to deform the tube, when pushing SST. 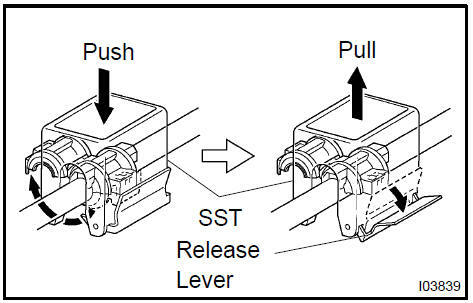 c. Pull SST slightly and push the release lever, then remove the piping clamp with SST. d. Disconnect the cooler refrigerant suction hose No. 1. HINT: Disconnect cooler refrigerant liquid pipe A in the same way as the cooler refrigerant suction hose No. 1.
a. Using pliers, grip the claws of clip and slide the clip and disconnect the heater outlet water hose. HINT: Disconnect in the same way as the heater outlet water hose. HINT: Refer to the instructions for removal of the instrument panel safety pad sub−assy. a. Remove the 2 screws, bolt and nut. b. Remove the air duct rear No. 1. Remove the bolt and nut. A/X models: Remove the 2 screws, air duct rear No. 2 and console box mounting bracket No. 1. M/X models: Remove the screw, air duct rear No. 2 and console box mounting bracket No. 1.
a. Remove the clip and console box duct No. 1.
a. Remove the 2 bolts and 2 earth wires. b. Release the 2 clamps. Remove the bolt and screw. Remove the nut and instrument panel brace sub−assy No. 1.
a. Remove the 2 bolts and instrument finish retainer lower. a. Remove the clamp, nut and passenger side junction block. b. Remove the bolt and earth wire. c. Remove the nut and clamp. 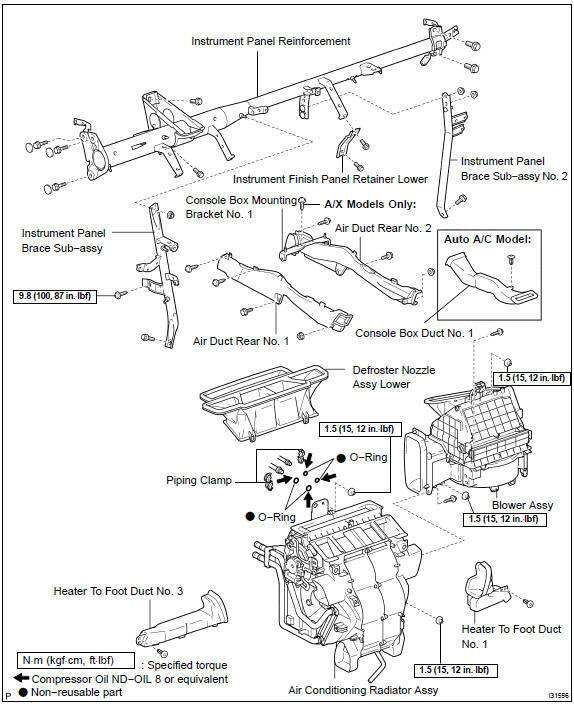 d. Remove the 2 nuts, bolt and instrument panel brace sub− assy No. 2.
a. Remove the clip and heater to foot duct No. 3.
a. Remove the clip and heater to foot duct No. 1.
a. Remove the 3 nuts and driver side junction block. b. Remove the 2 nuts and steering side connector block. Remove the 3 bolts, disconnect the steering column assy. a. Disconnect the 7 clamps and the wire harness. b. Remove the 3 nuts, disconnect the 3 earth wires. c. Remove the 3 caps, 7 bolts and instrument panel reinforcement. c. Disconnect the 6 clamps and the wire harness. 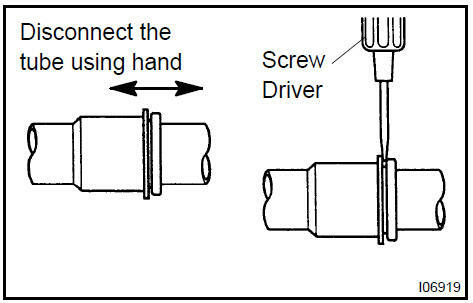 d. Remove the 2 screws, 2 nuts and blower assy. a. Release the 4 fitting claws, remove the defroster nozzle assy lower. Remove the 2 nuts and air conditioning radiator assy. a. Remove the 3 screws and mode damper servo sub−assy. Release the 2 fitting claws, remove the piping clamp. Remove the heater radiator unit sub−assy. NOTICE: Prepare a support plate and waste to catch the leaked coolant. a. Remove the 3 screws and air mix damper servo sub− assy. Using a hexagon wrench 4 mm (0.16 in. ), remove the 2 hexagon bolts and air conditioning tube assy. Remove the 2 O−rings from the air conditioning tube assy. a. Remove the cooler expansion valve from the cooler evaporator sub−assy No. 1.
a. Auto A/C model: Release the fitting claw, remove the 3 screws and air duct sub−assy. Remove the 12 screws and heater case LH. Remove the cooler evaporator sub−assy No. 1 from the heater case RH. d. Remove the 2 O−rings from the cooler evaporator sub− assy No. 1.
a. Apply compressor oil to the contact surfaces of 2 new O− rings and the cooler expansion valve and install them. Install the cooler evaporator sub−assy No. 1 to the heater case RH. Install the heater case LH with the 12 screws. 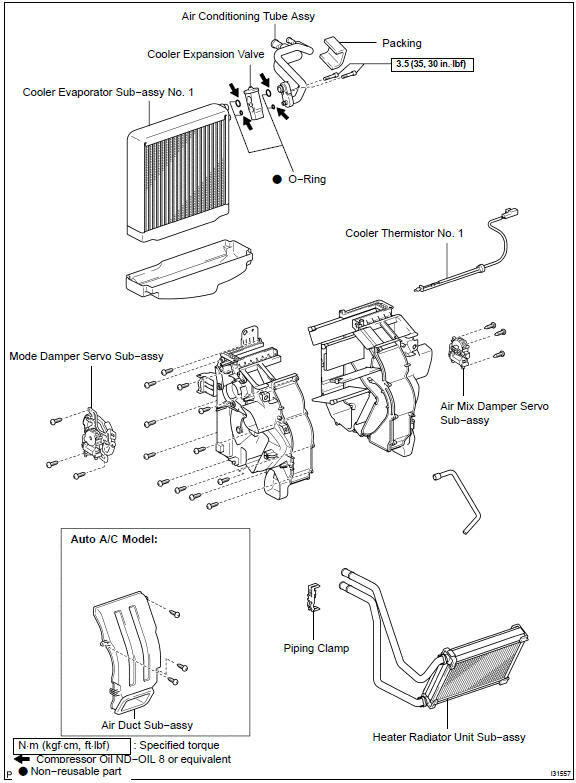 d. Auto A/C model: Install the air duct sub−assy with the 3 screws. a. Install the cooler expansion valve to the cooler evaporator No. 1. Apply compressor oil to the contact surfaces of 2 new O− rings and the air conditioning tube assy and install them. Using a hexagon wrench 4 mm (0.16 in. ), install the air conditioner tube assy and 2 hexagon bolts to the cooler evaporator sub−assy No. 1. HINT: Securely attach so that the gap in the packing will not be mode. Install the air conditioning radiator assy with the 2 nuts. a. Install the defroster nozzle assy lower. NOTICE: After locating the pin 1. in the illustration, install 2., then 3..
a. Install the blower assy with the 2 screws and 2 nuts. b. Install the 6 clamps, connect the wire harness. Install the blower connector holder with the screw and clamp. a. Install the instrument panel reinforcement with the 7 bolts and 3 caps. b. Install the 3 earth wires with the 3 nuts. c. Install the 7 clamps, connect the wire harness. Install the steering column assy with the 3 bolts. c. Install the steering side connector block with the 2 nuts. d. Install the driver side junction block with the 3 nuts. a. Install the instrument panel brace sub−assy No. 2 Ωith the 2 nuts and bolt. b. Install the nut and clamp. c. Install the earth wire with the bolt. d. Install the passenger side junction block with the nut and clamp. a. Install the instrument finish panel retainer lower with the 2 bolts. Install the instrument panel brace sub−assy No. 1 Ωith the nut. Install the bolt and screw. c. Install the 2 clamps. d. Install the 2 earth wires with the 2 bolts. Lubricate new O−ring with compressor oil and install them to the hose. Install the cooler refrigerant suction hose No.1 and piping clamp. HINT: After connection, check the fitting for claw of the piping clamp. HINT: Install in the same way as the cooler refrigerant suction hose No. 1.